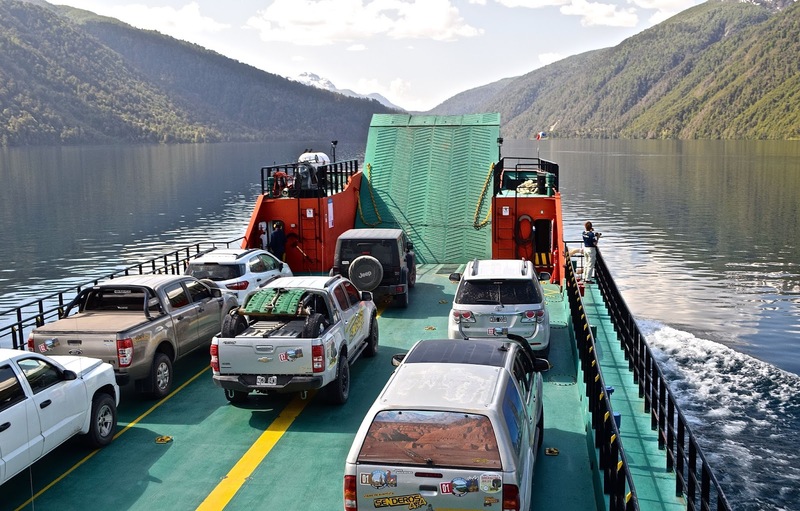 Wednesday, when I crossed the Chilean border and took the ferry across Lago Hua Hum to Puerto Fuy, I felt a little uneasy about what might follow. 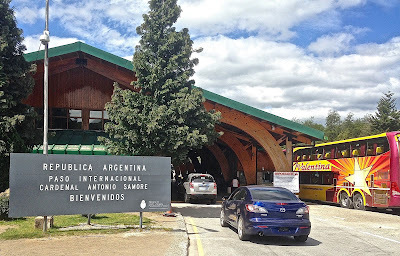 As I wrote some days ago, official Chilean intransigence – from one unpleasant customs official – had complicated my entry into Argentina but, after consulting with my Santiago customs agent, I felt returning to Chile and re-crossing into Argentina was my best option. 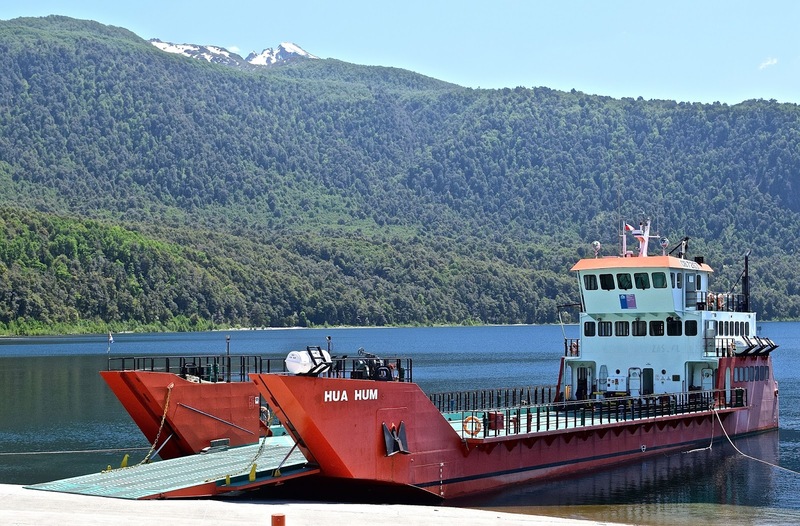 The ferry sailed west from Puerto Pirehueico (pictured at top) an hour late, at 4:30 p.m., because an Argentine tour operator had failed to arrive on time. It was a beautiful afternoon, though, as the ferry advanced among the dense verdant forests of the Andean slopes. 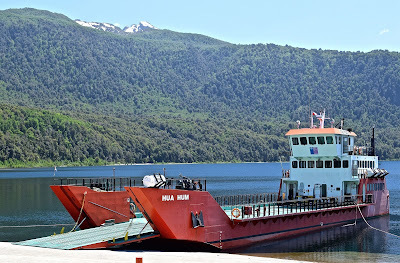 It was my first time on this route – when life gives you lemons, make lemonade – but on arrival in Puerto Fuy I left immediately for the town of Panguipulli, which had more diverse accommodations than the resort hotels near the ferry port. Panguipulli was also closer to Ruta 5, the Panamerican Highway that would help take me back to Argentina via the Paso Cardenal Samoré. 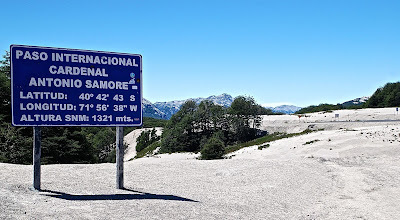 Thursday morning, approaching the Chilean border complex, I climbed along the winding international highway with little evidence of the volcanic ash that covered much of the area after the Cordón Caulle eruption of 2011. That’s because the prevailing westerlies carried most of the ash into Argentina, where piles of ash line both sides of the road, and there are numerous dead trees. This is the second busiest border crossing between the two countries and, as I took my place in a relatively short immigration line, I felt a little anxious. That part went routinely, but then I had to face Chilean customs to learn whether, like their counterpart to the north, they would restrict my ability to take my own car out of the country. My first step was a misstep. I lacked the initial paperwork for the vehicle because I had overlooked the nearby computer terminal that produces it – which the customs officer politely pointed out – so I had to fetch that before they could deal with it. 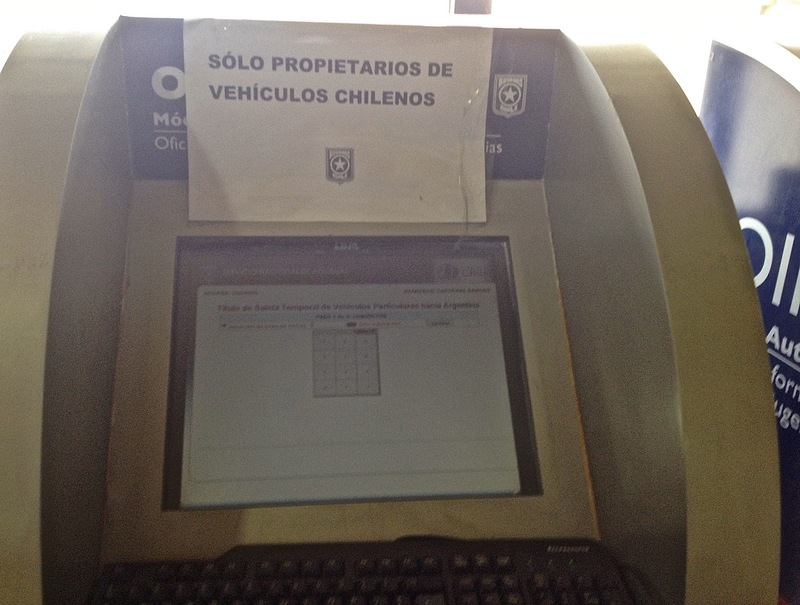 Fortunately, it was a fairly simply procedure that involved entering the license plate and the number of my Rol Único Tributario (RUT, the Chilean tax ID) that lets me renew the car’s license every March. Returning to the line, I was pleased to see the gentleman who attended me treat everything as absolutely routine – in only a few minutes, I was cleared to proceed to the Argentine side of the border. His cordiality and efficiency could not have contrasted more with the hostility that I experienced at the more northerly crossing. There was a small glitch, though. After I left Chilean customs and drove a few km to the east, something was nagging at me, and I stopped to take a closer look at the paperwork. It was then I realized that the computer printout had displayed my nationality as Chilean, with no mention of my US passport. Consequently, I drove back to the border complex and mentioned it to the official, who was unconcerned. He merely noted, in ink on the printout, that I left the country on my US passport (for what it’s worth, my RUT differs from the one granted to Chilean citizens – mine is technically commercial rather than personal). For my part, I was concerned that the Argentines might see it differently, but things went equally smoothly on the Argentine side and I continued to Villa La Angostura, where I found a comfortable B&B and has a pleasant dinner. 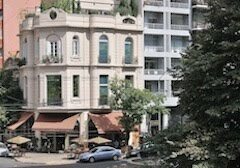 In the process, though, I had also learned that things might have gone better in Mendoza. When I inquired here about Hernán Lausen, the Samoré customs superintendent who had been so helpful to me last year, I was told that he was now at the Mendoza border crossing. Had I known that, things might have gone much more smoothly in the first place.